Snell Advanced Media (SAM), a broadcast technology specialist, found that despite the pressure for broadcasters to invest in 4K technology, 64% of Americans still don’t know what 4K is. SAM also found that Millennials are most likely to know exactly what 4K is compared to any other age group, but that still accounts for less than one third of all 18-24 year olds (29%). 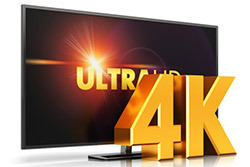 Given that 4K is touted as the next evolution in image resolution, it’s crucial the knowledge gap between broadcasters and consumers continues to close and the consumer electronics industry embrace an ethos of transparency and education on what to expect in the new era of 4K content. The study, conducted with third party research firm YouGov, revealed not only consumer understanding of 4K, but what content Americans are making a point to watch live. Broadcasters have been preparing for 4K for some time now by upgrading their infrastructure and prepping content for enhanced formats. However, despite their focus on the evolving era of 4K, consumer understanding still lags. Some 11% of U.S. adults currently own a 4K TV, with half of those either yet to find it worthwhile or understand what it does. Though 17% of early millennials (25-34) actually own a 4K TV, the highest among all age groups. However, once educated on what 4K was, 41% of consumers said they would like to have a 4K TV.